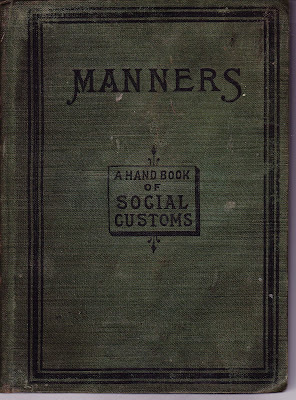 I have collected old etiquette books for some time, but one has been very elusive. I was interested in the book because of the author, who was not listed. The book, Manners: A Handbook of Social Customs was written in 1888 by Elisabeth Marbury. Marbury was a literary agent who handled big names such as Oscar Wilde and George Bernard Shaw. 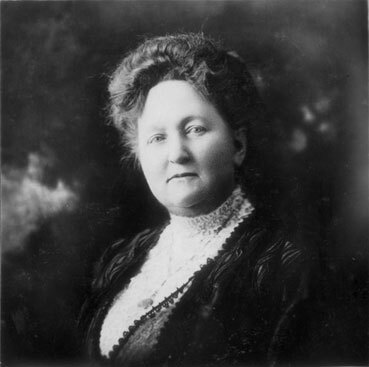 She was a theatrical producer who created the notion of a Broadway musical having a "book" to wrap the songs around. 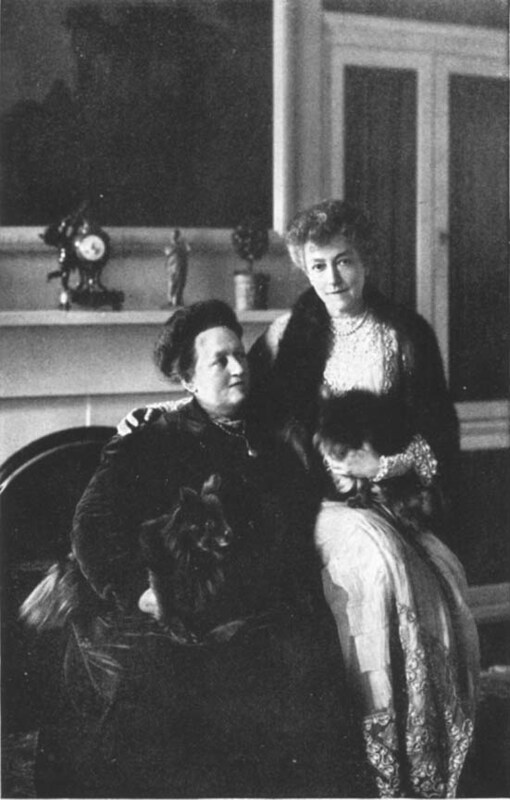 For thirty years, Elisabeth Marbury lived with Elsie de Wolfe. Recently, after years and years of searching, I found a copy of Manners. grooms to wear cockades on their hats. but wait for her to signify that his presence in house will be agreeable. It is the duty of a chaperon to see unmarried ladies safely home. My personal favorites are Marbury's notes on a simple dinner party with the courses laid out so there will be no confusion. Pay heed for your next soirée. Third.- fish, with which, if in season, cucumber salad should be served. Fourth.- An entree of some kind. Fifth.- Meat and vegetables. Two kinds of the latter always sufficient. Sixth.- A vegetable, such as asparagus, cauliflower, baked tomatoes, artichokes, or small dish of some kind. Seventh.- Game and salad, or crackers, or cheeses and salad. Eighth.- A sweet and cake. Now we have a better idea of why Bessy was such a big-boned girl! And finally, I leave you wanting more... info, not food! There is a wonderful joint bio of Marbury, de Wolfe, Anne Morgan and Anne Vanderbilt entitled, Ladies And Not-So-Gentle Women, by Alfred Allan Lewis. If you love Edith Wharton, Stanford White and New York City, I think this book is a must read. I have to run as have to check the coachman for cockades. If I catch them with those vulgar hats again, there will be hell to pay! If I were having an elegant dinner party--that is, if I were someone other than who I really am--Elisabeth Marbury would be at the head of the guest list, while Elsie, for all her worked-for glamour, wouldn't be on it at all. Elsie was a great decorator, with a keen eye for antique boiseries & rich potential clients who was always looking out for herself, but Marbury was a dynamo, a great & brilliant & generous woman who extended friendship to a wide circle of people, and launched a slew of successful careers in the process. And how can you help but like a woman who begins her autobiography with candid confessions of cheating her childhood playmates out of their pennies, and of staying home 'sick'--while her God-fearing Presbyterian family attended church--in order to eat the Sunday dessert all by herself? Or who recounts how, at a Salvation Army charity concert that was dying on its feet, she got up & hollered out "Who will pay one thousand dollars to see me dance with this policeman?" She wasn't talking about a waltz, either, and this at a time when, going by photos, she must have already been close to three hundred pounds. 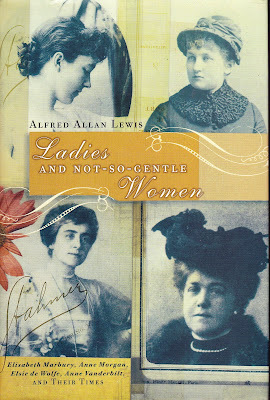 In another passage, she cheerfully admits "I am every pound a woman." Marbury's flat-out honesty--even when it must have been painful-- separates her story from the many wherein such matters are cloaked in genteelisms, if not suppressed entirely. Yet, as honest as she is about herself, she is never hurtful about others' motivations, although she doesn't pull any punches when describing their sometimes less-than-noble actions. Anyway, while Elsie would only purse her lips & cast her disdainful eyes over my machine-made sterling, mass-produced china & mediocre cooking, Bessie would so soon have a whole table of strangers talking about things they had never considered before that no one would even notice the food on their plates--which could only work in my favor. Sadly, it's too late to invite Bessie to dinner--and I'm not even sure who's comparable to her today, in terms of her incredibdibly wide circle of friends: I've certainly never met anyone like her--but the next best thing for people who don't know any more than her name (and her connection with Elsie) is to track down a copy of My Crstyal Ball and get the story first-hand. As Aesthete's Lament said a few years back, it's time for a Marbury revival. Even more so now, than then. magnaverde, you are so right. I believe Miss Marbury is ripe for a bio!